2) Slide 7 (8mm) beads to the bend in the wire. 3) Slide 6 beads onto one end of the wire keeping them near the end. Thread other end of the wire back through the 6 beads and pull tight. Flatten out the rows as needed. (See Diagram 1) Flatten out rows as needed. 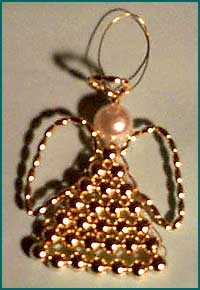 4) Slide 5 beads onto one end of the wire, push the other end through all 5 beads, and pull tight. 5) Continue adding beads using the same method until there is a row with just one bead. 7) Pass both ends through the 16mm bead. 8) Take the longer end of the wire and thread 8 3X6mm beads. Take the other end of the wire and form a hanger loop. Take both ends of the wire and wrap them around the wire just below the halo. 9) Cut off any extra wire, adjust the wings and SMILE!